I have experienced first hand both hurricanes, Katrina and Sandy. My grandparents, friends, neighbors, and residents of New Orleans lost their house and livelihoods as a result of Katrina’s force. People were left with nothing but the clothes on their back, affecting them not only physically, but also psychologically. The lamp post that brightens the streets has now become a beacon of hope and access to information during and after a crisis. There are over 250,000 street-lights and an estimated 12460 traffic lights throughout New York City. During and after a flood these tall objects are still standing. Most of the time they have lost power, but that is not always the case. In the Anchor website, residents are able to chat with local agencies and see city updates in real time. During a crisis, when residents do not know what is going on, they become anxious. Multiply that by thousands of residents it becomes a very chaotic in an already chaotic situation and this impedes disaster relief efforts. This add-on will consist of a wifi router that will create a free, resilient, stand-alone communication system where residents by connect and chat with local agencies. 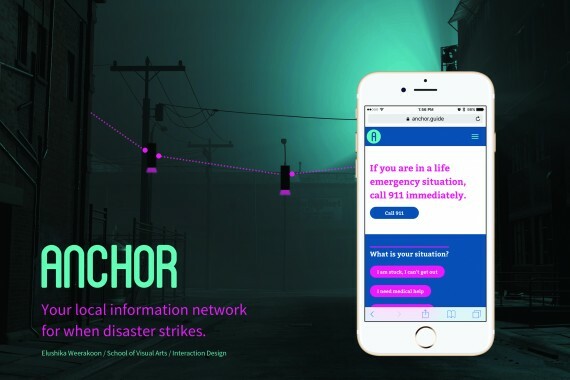 Anchor, Your local information network for when disaster strikes.